Oscar (7) & Snowy (4) are Miniature Schnauzers. They have been kept in a shed for the last year and so are still recovering from this ordeal. They are best friends and we will not separate them. Oscar is not as confident as Snowy and takes a wee while to come around to new people. He is terrified of crossing thresholds into buildings and so needs gentle encouragement to come indoors, he is not being naughty! Snowy is more confident and once she’s sussed you out will seek affection. Snowy’s skin is a bit of a mess, veterinary investigations suggest is might be hormonal so she has been spayed recently in the hope that her coat might return on her torso. Because of their lack of socialisation they find leads and walking a bit overwhelming just now but they’ve come on really well since their arrival so with the right people, doing it at the dogs pace, their confidence should bloom. We feel that a quiet home, in a more relaxed rural setting would be nicer for them, they will need their own private and secured garden to romp around in too. At this time, children under 10 years of age will be too much for them. We do not know how they will be with cats or other pets but they are ok around other dogs. 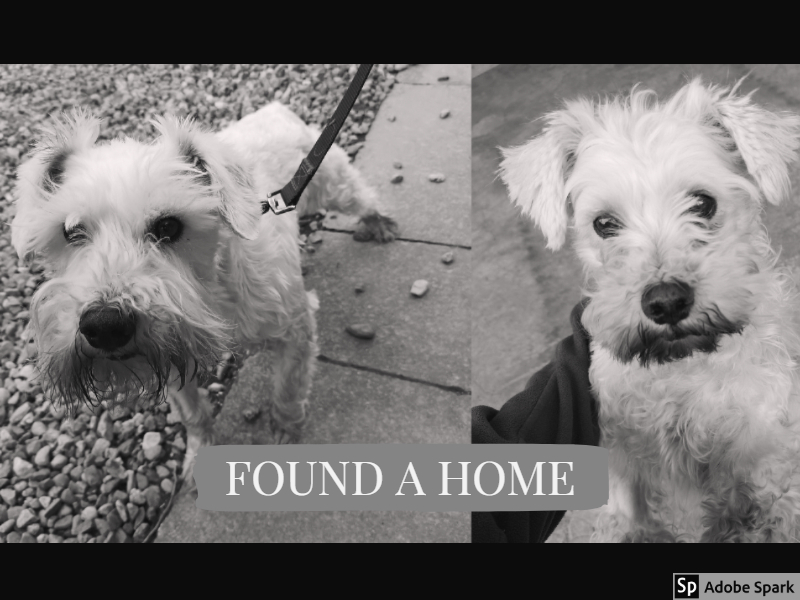 This entry was posted in Found a Home and tagged adoptadog, Rescue Dog, schnauzer, white dog.